cdto2012 wrote: I have never commented much on the Choy study, it seemed a bit thin in documentation to me also. There must have been hundreds of photos that could have been released. I am not a big fan of domed head shape taking all of the blame for MPB either. It kind of reminds me of historically when they would determine intelligence by measuring head size. Skin/scalp flexibility, elasticity, and health are determined by nutrition, irritation or swelling (by mites/foods/chemicals), scarring genetics, circulation issues, and many other things. People get face lifts and do not go bald, but the scalp must be tighter. I am pretty sure I did not shrink or flatten my head in 2 months either. Fortunately this study did establish for me that massage does not hurt the scalp, and I am thankful for this. Thanks for the update Reborn Hair, you have given a lot of positive things to the cause and it is nice to hear you are feeling the results. I thought I would take some pictures before I left this hotel room and light. I have a very unpredictable life and never know future factors. Since the very first weeks of posting I have tried for "grow hair before your eyes" level of documentation. 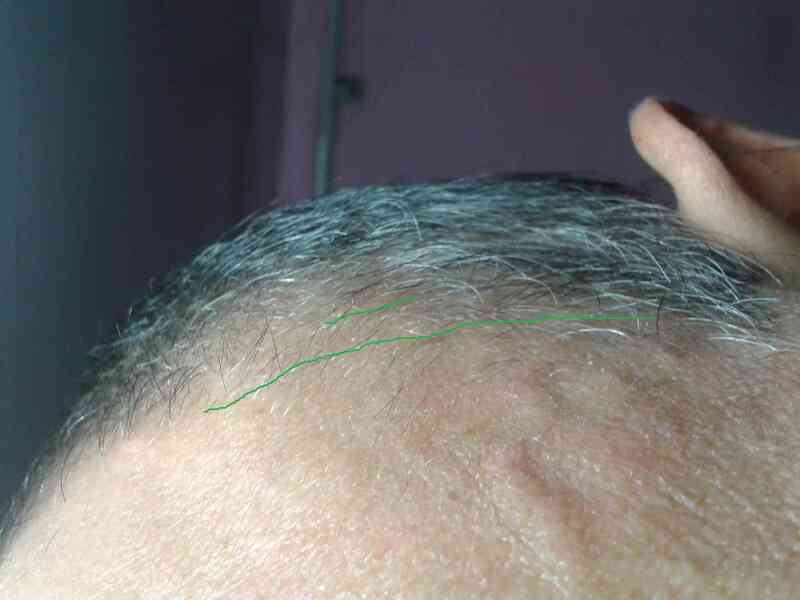 As you will see from the first photo below, I put two lines there for the original receded hairline location. If somebody cares enough to go back and track hairs to be exact they can. Lucky for me, the hairs grow fast enough that they have enough new progress that is evident that the precision tracking is not so important to me. Mostly if I wait too long between photo sessions, the new hair just look like normal old hair. Thanks for reporting inn so often! I have a few questions tho, how long have you been doing this now? And do you think you might have full regrowth or just minor results? About the duration of treatment around 2 months and 3 weeks, I meant post it in the write up, it is in the post title where most people don't look. The process of micro hairs lengthening is pretty basic and just keeps repeating in phases in different areas. This is why it is so important for people beginning to do the special light and close up photos to see if the growth has really started. Once the micro hairs are extending the rest of the process just takes time. So provided that I can stay online, I hope to document the complete regrow. There is such a increase of speed once the hairs near full diameter and grow as fast as the beard. I notice that some of the new hairs and even grafts are starting to curl and darken. In this current light the smaller up-coming hairs, next to fill in the density, are hidden. 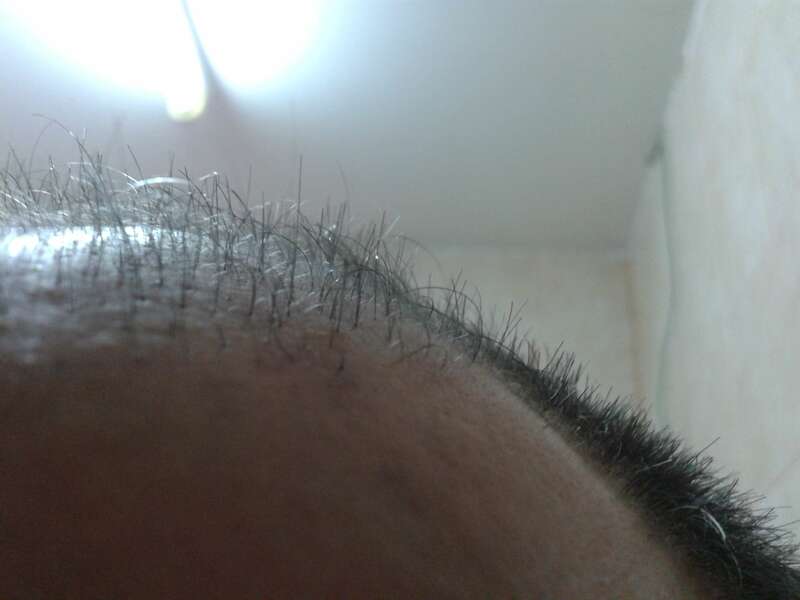 Even if I was fooling myself and the areas near the receded hairline were not growing as much as I perceive, that is not what I am tracking progress by. For so few weeks spent, and to have any real hairs show in the mid temples - far from the receded hairline is just amazing. 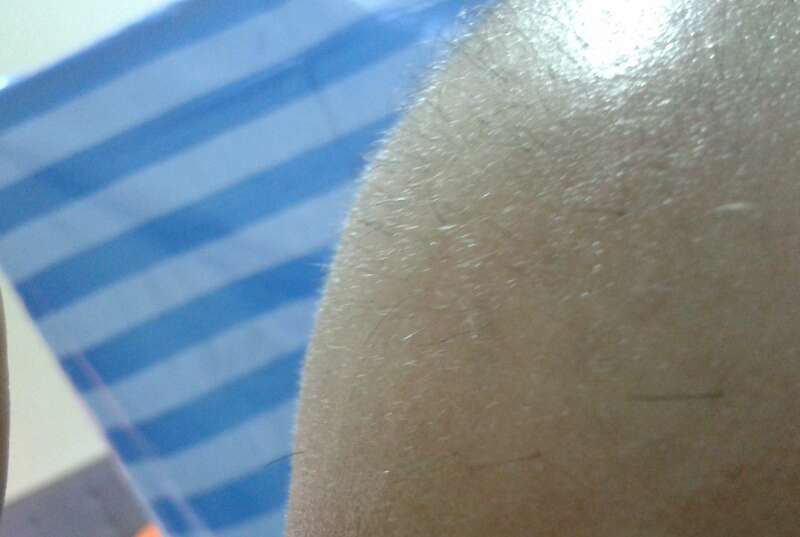 I also have at least 10 full diameter hairs that have popped out in other random places in the middle of bald areas. 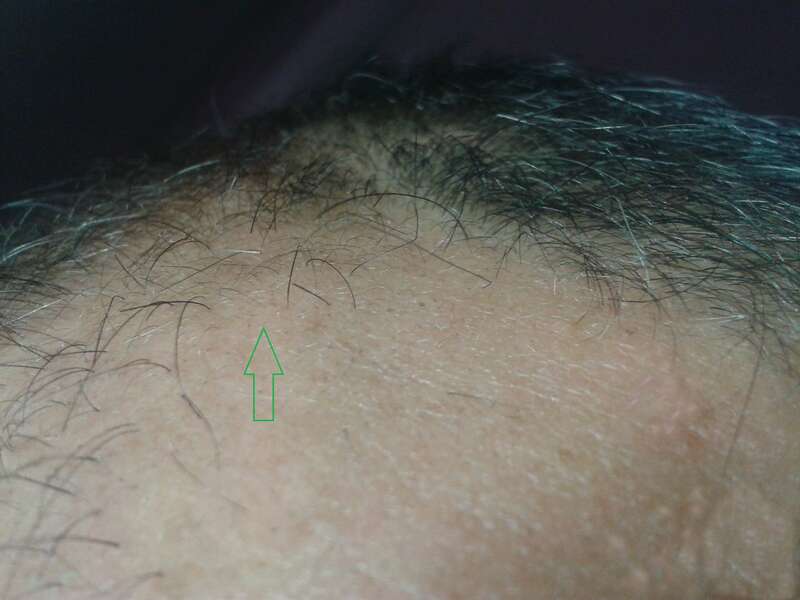 If these two things are easily seen and photographed, how much more is the regrow in the normal places like the hairline ? I can see it in real life, the hairline may have progressed forward nearly 1/2 inch with thin coverage. 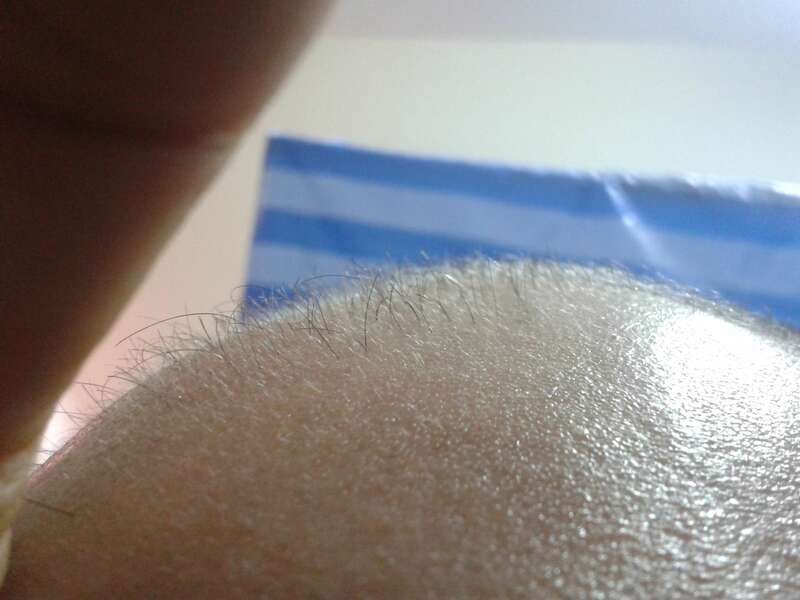 You can go back to the earlier linked thread and see these hairs (before the shave) as just thin fuzz. I can see the micro hairs already lengthening to cover the rest of the open areas. So I am 80% sure this is just a matter of time until a full regrow. I would guess about a year more for full density coverage. I the camera really is essential to track these early stages, just looking in random light is not effective. Hey Cdto2012, I just tried your method with an empty plastic vitamin bottle. My hair feels great, I got in a good massage for about 20 minutes. I might have to add this method to my routine, only thing is I won't have time to do it 3x a day. My scalp and forehead feel so loose and I can feel the blood rushing in. Wouldn't doing this for a long period of time bring wrinkles though? That's the only thing I'm concerned about. Thanks for this method bro. Glad you enjoyed the massage and it was not too painful. I was thinking that the CPR meant that you press the scalp, then take 5 breaths to deal with the pain. I have seen the skin quality move in the firming and healing direction, rather than a saggy loose effect. I have possibly seen a slight reduction in my forehead wrinkles, for sure they are not worse. I usually massage my face also with oils. I do a special medium linear finger rub/ swipe under my eyes. For sure the dark circles have been reduced. This is the firming of the skin and strengthening of the capillaries. Do be aware not to crease the forehead along wrinkle lines or do pinching anywhere. Keep rubbing of the skin to a minimum. Press down, make the small circles moving with skin against the scalp. A little bit of skin movement is likely to occur, but I do not think wrinkles are likely to occur. You can roll with the side of the bottle areas like the forehead if you are really worried. Even if you only have 5 minutes a few times a day, try to get the veins to bulge. After the pain is mostly gone from the pressing (after about 6 weeks) I think that 15 minutes three times a day may be enough. I can use much more pressure during that time and it only takes 5 minutes to get the veins to bulge, The rest of the time is to cover the entire scalp and move the blood around as much as possible. The skin on the top of my head has never gotten as flexible to the pinch test as normal skin. Not sure if it ever will, but I will keep on pressing and it seems to be regrowing anyhow. Maybe someday somebody will post about their times with the enzyme treatment. It is a real wow realization when you realize the benefits for $3 of meat tenderizer and honey. The selective regeneration of the skin is really something to experience. Cdto2012 do you think this method can stop skull expansion? could you use fat Calipers to pinch the scalp ? Hi, nice to have others join in. I hope some real scientific people do get the interest to do some instrument measurements and maybe university level cadaver research. As for stopping skull growth, I do not think the pressure would do this. The pressure is very good for strengthening bones and maybe even making sure they grow if they want to. Actually bones are piezoelectric meaning that when they are pressed they emit an electric charge, I think they even light up a bit like stone crystals do when hit. Interesting thought considering it might effect the skin or charge the area. In the original linked thread there is some fascinating research that I posted about electric charges and learning speed and how it relates to electron donor PH . PH effects oxygen capacity, mineral content, immune ability, and electrical functioning. My thought for today is, why have my grafts grown fine for 15 years on skin that was lacking the skin support with possible low circulation, maybe stretched skin, maybe inflammation, and probably calcification ? I am supply starting to think the answer may be in the capillary or very thin blood supply vein that supplies the follicle . From the graphics I posted it said that the vein was only one cell wide. This is like a small straw that could be blocked and partly restricted easily. If the skin area near the growing bones of the skull were more likely to have calcium for depositing; maybe that calcium crystallizes and blocks the thin vein to the follicle. So the grafts have a clean supply vein. I suppose the grafts may/do also slowly get blocked veins over the years, but maybe most of the skull growing is done by 30 years old. As I wrote in previous posts. I am thinking that the hard pressure may have the ability to break up the calcium and unclog this follicle supply vein. I will add that I have unusually low blood pressure, I guess from being very athletic most of my life. My thought is why would my body make the effort to ensure that the blood flows through such tiny follicle vessels where the blood pressure is the lowest at head level? If the veins were even partly blocked there may not be much pressure to force blood through. I keep searching for an answer to why young guys can get severe shedding starting the MPB cycle in their 20's. Their body system is not normally degraded or suffering long term aging related effects , their needs to be an explanation of something dramatic that happens, or something as simple as the clogging of a super thin follicle supply vein. If the answer could be a simple one, then hopefully the solution might be simple also. I mentioned that 15 minutes 3 times a day might be enough after the pain of pressing is greatly reduced. I am still practicing 20-30 minutes 3 times a day. I do not want just a slow grow. Once the hairs go full diameter they grow very fast. i can use tow angle of this cap ..hard and soft one ..but it seems no big pain and it cant get the oil out but it break/melt / destribute it ..more area mean more bore to exert the oil ..so you need enzyme to help this procces ...glycolic acid or papya as cdto2012 use . Hi, the bottle cap should be fine, watch for plastic being melted if you use it with oils. I guess you would need to have the cap on a bottle to get two handed pressure. A forum member is listing a head pressure (massager)/relaxer for sale, on the product research link there an interesting Japanese study that claims 40% regrowth response rate due to the increased blood flow generated by the air bag pressure . It is really worth a look, as they measure blood flow with thermal tracking, and have some pictures of hair. They also talk about minoxidil being a vaosdilator (blood flow increase) for why it works at all. I noticed that the presser seems to press blood from the sides of the head to the top, reminding me of the diagrams that I posted of the vein structure. Interesting that in their evaluation, 16 out of 40 they reported as excellent results. This was graded by all of the vellus hairs had began thickening over the entire area of alopecia . They had achieved this basic lengthening over 3 months observation. They allowed the study to go for up to a year. This is what I have also observed. yes this tool looks same as that one on ebay ad by "salty" user ..
so the air bag goes only around the head not above just like a band , again i will say this not only a scalp massage it is also a skull compress ...hmmm very interesting , i downloaded the pdf ,thanks cd. this thing direct the scalp to be away a little from the bone making a cavity between skull and a scalp so blood will cerculate free ..this is exactly what inversion do but in a eazy way. long hair wrote: ..... hair loss cause is all about blood cerculation ..DHT accumulated after blood restrected (low oxogen level)..researchers found alot of DHT onley in the bald regeon so they think they found the creminal and they going to attack hem hard with drugs ..but still have fullecls not feed enough no matter what drug we use ..so hair loss continue. i have to say i too reached similar conclusions.. blood circulation.. as the lack of circulation allows for more DHT creation. I have a lot of neck and scalp muscle tension.. i wonder if there is a correlation between neck muscle pain and scalp muscle tension and hair loss..
chines say our hair strand is a blood extension ..if you consider follicle as a production line you will see that you can't have good products (out) with poor raw materials (in). i think massage movment squeeze and relase the capillaries make it compress the blood to the follicle so its cells will divide faster .. it is a poor random proscces but with time we have gain some regrowth. 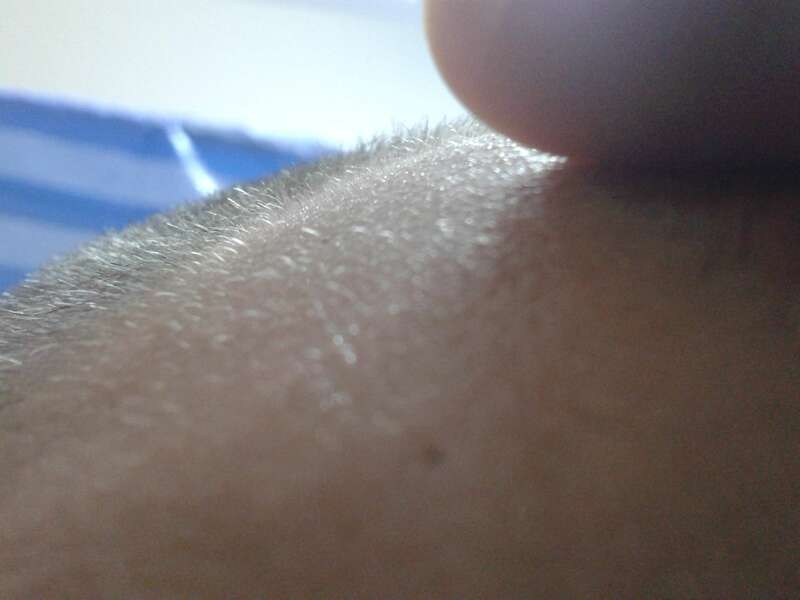 I commented in the other thread I had managed to flatten the ridge in the back of my scalp, my crown area (as well as my entire head) feels amazing. It feels warm and so alive. I don't know how I didn't realize I had such a hard ridge building up all this time. I'm not worried about the crown area anymore, I'm sure I can get that area back to 100% since that ridge right above it is gone. My right temple has receded much more than my left temple. The recession looks so neat, it almost looks like I got a bad haircut. I'm hoping CD's bottle method can help me regrow the hair that used to be there. I've started applying Emu, Coconut, and Castor oil to my temples every night. I also use a glycolic acid peel 20% once a week. Getting this temple hair back will be difficult but I'm ready for the challenge. I plan on going on a water fast for a few days, I'm hoping I can cleanse my kidneys of any toxins built up. Hopefully that can help in my quest to get my temples back to a 100%. I'm optimistic! When you say rub circular motions, do you mean sliding the bottle on skin or holding the skin in place and grinding against whats underneath? Do you do normal DT or have you completely replaced it with this method? I only have a receding hairline and very thick hair on top,sides an back. Is it ok to do this where i have hair? Hi, I was traveling for a few days, sounds like there is some dynamic shifting going on with Movie Junkie. Kind of keeps a thread interesting when things happen. In the next few days I hope to get some photos posted, it seems like my upper hair sides are going to put on a show to watch, they are thickening up daily, have to see how it photographs now that I am back home. As for the technique, I never did a generic DT, just pretty much straight to this DT-CPR method. I had to post pictures 2 1/2 weeks after starting because I noticed lengthening so quickly over my temple vessels. For the technique, it is holding the skin in place and grinding against whats underneath. We try to avoid friction on the skin, pinching, and creasing to avoid wrinkles. Indeed I do press the existing hairs, especially above the ears area to invigorate the vessels there. I can see the veins on my temples bulge to insure that the job is being done properly. As you can see from my grafts, no damage to existing hairs has happened. Glad you are interested. I have been pondering a bit what my life would have been like if I had learned to keep my full head of hair. On a side note, I wonder if somebody mentioned/linked this thread on one of the mainstream forums. It seems to be getting a lot of views quickly. For the sake of those who might benefit from the ideas I hope this does happen. I tried to post a link to it on a major forum and they deleted my account probably thinking I was spamming or kidding with results after a few weeks. Ever since I've begun this method I've been feeling like I'm on the verge of a breakthrough. 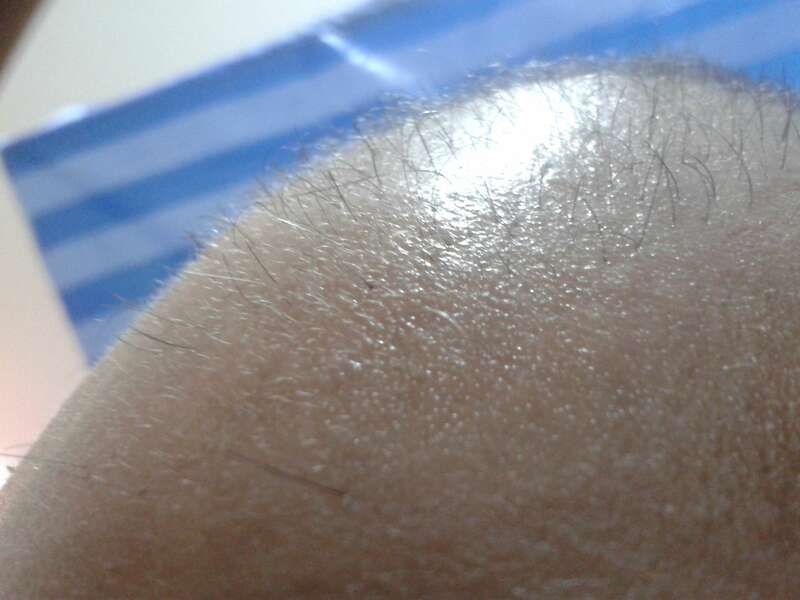 I'm honestly starting to think Calcification plays a major role in Male Pattern Baldness. The back of my head had been thinning and feeling hard, now that the scalp ridge is broken the crown area feels alive again. It actually just feels like that area of my scalp had gone "barren" for lack of a better word. I was using essential oils there and a bunch of other things for my crown area and it felt like nothing was gunna work. I can now see why things like oils, pills, or lasers would fail. If you have a bunch of calcification going on in your scalp those things won't be able to reach your hair follicles. 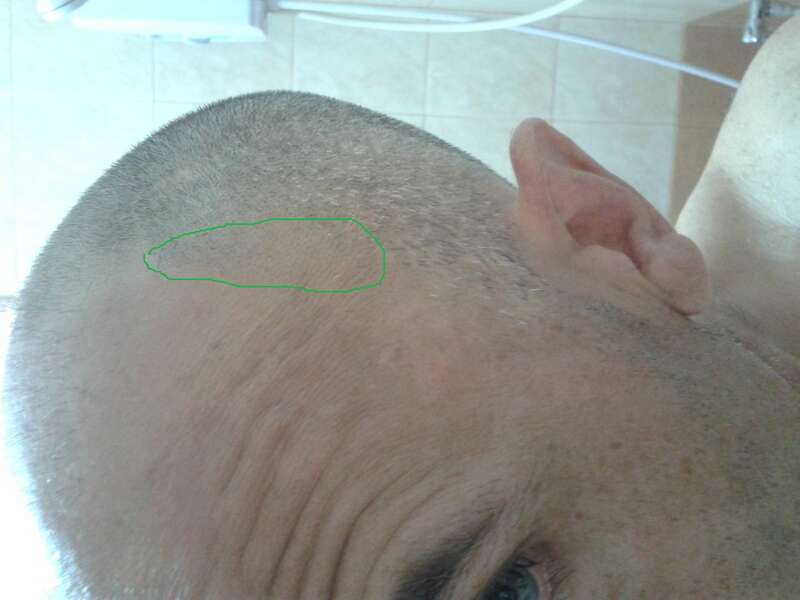 Amazing how my right temple has gone nearly bald and I can feel the calcification right below it, my left temple has only receded slightly and I don't feel nearly as much calcification in that temple compared to my right. I want to incorporate magnesium oil and vitamins K2 and D3 into my routine, as I feel those vitamins along with this DT-CPR method can completely reverse and destroy the calcification process. Exciting times for me, I can't wait to beat this thing. "Magnesium Oil sprayed and massaged into graying hair each evening and left on overnight, will begin to restore natural hair color within weeks and stimulate the growth of hair and greatly improve hair texture. Magnesium Oil massaged onto balding areas of the scalp will begin to induce the growth of new hair." This along with the DT-CPR method would work excellent imo. 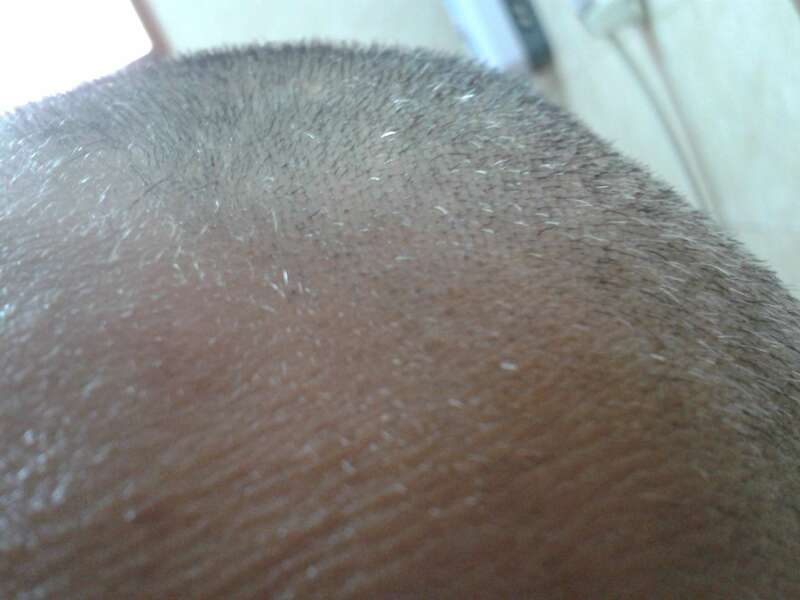 MovieJunkie89 wrote: I commented in the other thread I had managed to flatten the ridge in the back of my scalp, my crown area (as well as my entire head) feels amazing. It feels warm and so alive. I don't know how I didn't realize I had such a hard ridge building up all this time. I'm not worried about the crown area anymore, I'm sure I can get that area back to 100% since that ridge right above it is gone. My right temple has receded much more than my left temple. The recession looks so neat, it almost looks like I got a bad haircut. I'm hoping CD's bottle method can help me regrow the hair that used to be there. I've started applying Emu, Coconut, and Castor oil to my temples every night. I also use a glycolic acid peel 20% once a week. Getting this temple hair back will be difficult but I'm ready for the challenge. I plan on going on a water fast for a few days, I'm hoping I can cleanse my kidneys of any toxins built up. Hopefully that can help in my quest to get my temples back to a 100%. I'm optimistic! "Because pattern baldness is associated with hormones and signaling substances that negatively influence bone metabolism, I think it's likely that the intracellular accumulation of calcium is involved in the genesis of pattern baldness. However, whether that involves a "solid ivory" calcified scalp — I don't know." Did you read the link that you posted? So here are the things it seems we need to do. Stop Skull Expansion, Decalcify the Scalp (And probably the entire body for good measure), and reverse existing bone growth. Stopping Skull Expansion: Regular DT or Cdto2012's DT-CPR method should be able to do the trick if one is consistent. Reversing existing Bone growth: After we've halted skull expansion and decalcified the next step will be to reverse existing bone growth. I would assume this is extremely difficult and would be what stands in the way of folks who are receding and balding in growing back a full head of hair. I've been searching all over the internet for this and can't seem to find much (Outside of Paul Taylor's e-book which I currently don't have money for lol). If there was a way to reverse existing Bone growth we'd probably have this thing beaten. Ah, you guys may have been noticing I'm posting a lot more it's because I feel like I'm close to finding some crucial info. Hi have been busy after some travels. Finally got some photos together. There seems to be plenty of development to show. I clipped my hair after 2 days traveling and almost no sleep. I oiled the clippers and forgot to replace the spacer. The side temple areas just about got shaved along with the rest of my side hair. They will be grown back out in about 2 weeks and we can watch the regrow rate of the newer hairs. Thanks to the treatment supplying fresh development areas every few weeks; there are photos of other areas that look encouraging. I never clip the grafts area, just trim with scissors, so the pics are mostly of this area. First set are of the area at the very front of my grafts area ( upper front forehead). 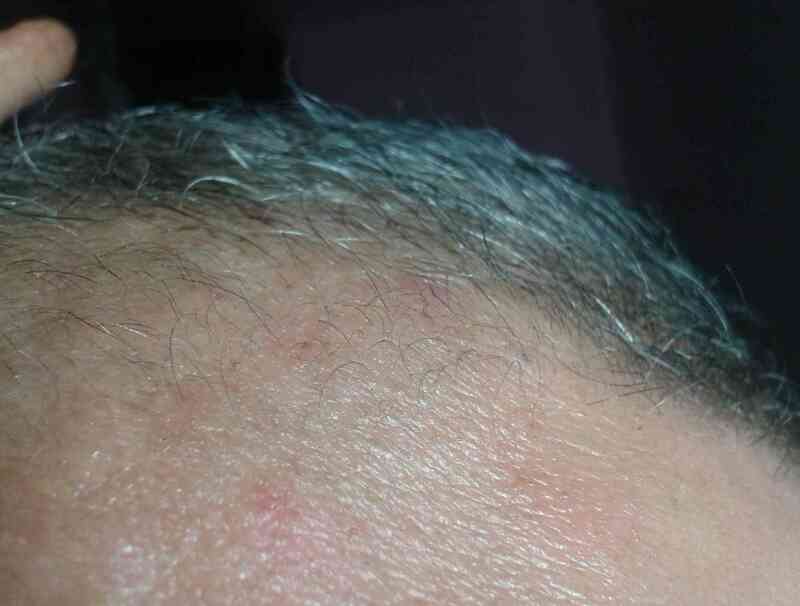 There has always been some minor underlying fuzz under the grafts and some thin long hairs . What is being seen now is the lengthening of the grafts area sub mat, and some fresh lengthening outside the grafts area. Remember, if I did not have grafts this would be so far from any hairline. The areas surrounding the grafts was just about shiny clean bare before treatment. I always oil before photos to help the lighting. Many of the thick long hairs you can clearly see detached from the grafts area are new and have just sprung out full diameter. The grafts are orderly, about 1/4 inch apart and in a patterned area. You can see from the very first post the raw grafts in the before photo. Here is another basic before photo from early November, you can see the patterning and some of the lighter hairs that grow around the grafts. The next 2 are showing the lengthening in the upper sides. This area was also slick bald with no fuzz previously. Finally the hairs are thickening. This area is the Olympics of regrow, basically like an ultimate goal being realized to see it actually growing across the area. The last 2 are just general reference photos. The first one I circled an area that might have filled in and advanced forward some. Not really sure, but the profile of my hair just looks better by the week to me. The last photo is just to show what the previous featured temple area looks like as stubble as a reference. The wrinkles in my forehead are just because I am looking up to take the photo. Just a quick update, this is my 5th day using Paul Taylor's skull expansion techniques. I ended up buying his e-book and I don't regret it one bit. His theory is very sound in my opinion and his techniques are awesome. I use his techniques along with cdto2012's DT-CPR method. So far what I've noticed is my head has become even more "flat", areas on my head that used to bulge out are now very smooth and flat (This has more to do with the DT-CPR method than the skull expansion techniques since I had started doing the DT methods a few weeks ago). I'll keep you guys updated on my progress. Paul says the earliest one should expect results is 3 months. Since I only have temple recession and slight thinning in the crown I think that time frame should be right for me. I hope I can beat this thing soon and not have to post here anymore. The longer I post here the longer it means I've been battling MPB. Yes it seems a good sign to have the skin flaking off and regenerating. A few guys have had similar to what you describe. I usually have the caps or dead skin areas about 2 days after I do the enzyme treatment. 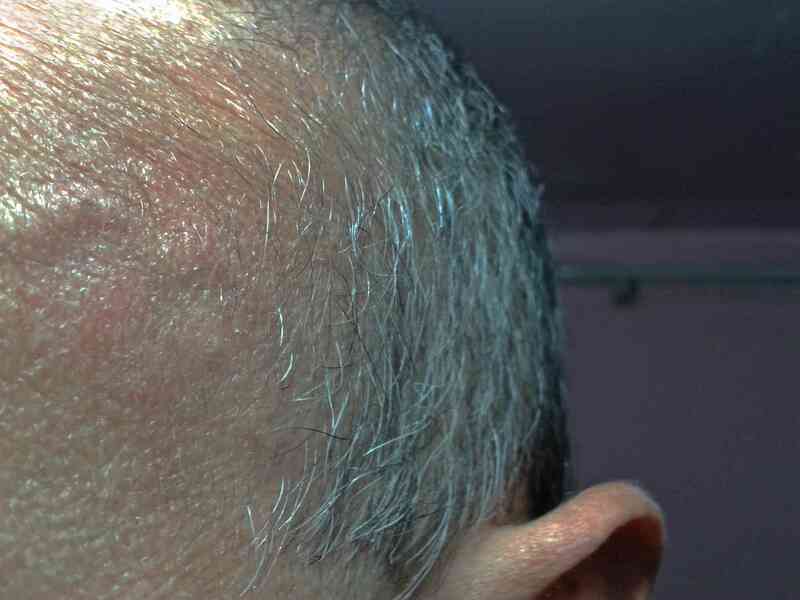 This last treatment is the first time had no skin loss, I think this is a sign that the scalp has become quite healthy. I have almost no pain upon pressing, and regrow progress seems positive. I have been traveling again, so I will post new pictures in the next few days. With the growth on the sides of the grafts thickening my confidence in a complete regrow is very high. It is just a matter of time, not much doubt at all that this method is fairly mechanical step by step process. Feel free to post any of your process observations.